Welcome to my website where I will be your creative coach. I hope to Inkspire you and educate you as you embark on your creative journeys. It's a little late as I meant to post this before Hallowe'en, but this card is just too cute NOT to share! 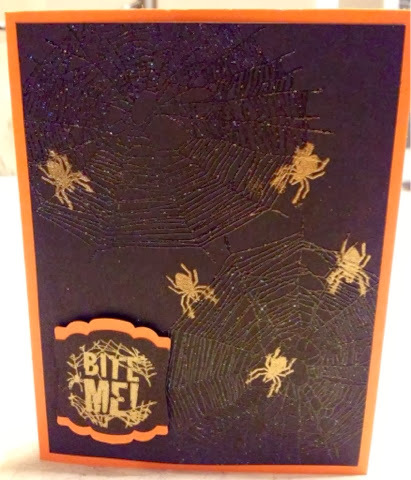 I used the new photopolymer stamp set Bite Me to create this spooktacular card. Pumpkin pie & basic black cardstock with a touch of gold give this card a perfect Hallowe'en look. To place your order for this spooky stamp set, simply send me an email, give me a call at 289-280-0304 or shop my online store! Happy Stampin'! Get the Gift you REALLY Want! All Images copyright Stampin' Up! 2008© The content of this blog is my sole responsibility. Simple theme. Powered by Blogger.